I reported that beetles began to appear on the scene early last week which seemed a bit early [see BYGL Alert! "Masked Chafers and Japanese Beetles are on the Wing," June 14]. It also seems early for high populations to be causing heavy feeding damage on leaves and flowers. Japanese beetles were flying well below our radar prior to 2016 with rare reports of damaging populations. That began to change in 2016 when we saw some heavy localized populations in many areas of Ohio [see BYGL Alert! "Japanese Beetles Making a Comeback," July 7, 2016]. The beetle revival continued last year. I reported that damaging populations were appearing in the southwest, central, and northeast parts of the state [see BYGL Alert! "Japanese Beetles Abound," July 5, 2017]. 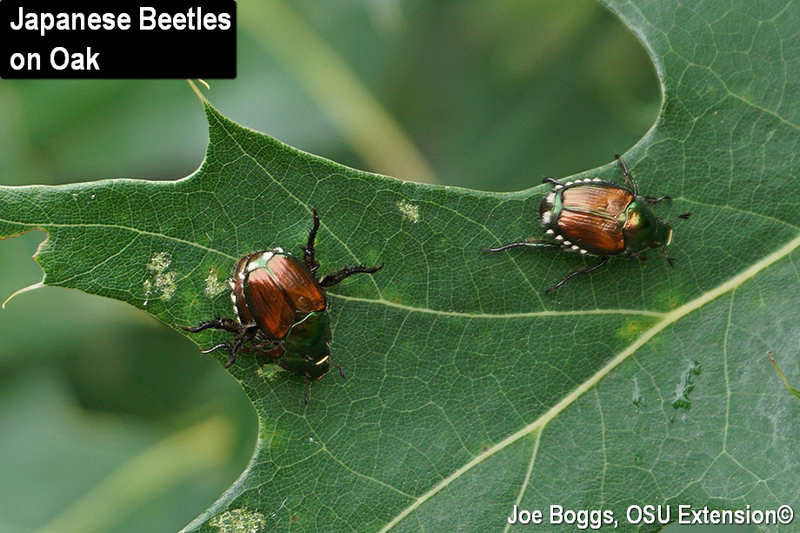 Amy Stone (OSU Extension, Lucas County) wrote a follow-up report that high numbers of beetles were also being seen in northwest Ohio [see BYGL Alert! "More Japanese Beetle Abounding," July 6, 2017]. Although Japanese beetles were widespread throughout the state in 2016 and 2017, their populations were highly localized. A short drive could take you from a location with high numbers to another location with virtually no beetles. Beetle populations seem less "patchy" this season with a widespread distribution and few "hot spots;" at least in southwest Ohio. Are we seeing the beginning of general Japanese beetle outbreak? The short answer is we don’t know. The long answer is that despite being a non-native, Japanese beetles have started to behave like natives in some areas of North America with populations rising and falling naturally. As with native pests, there's always the possibility for periodical outbreaks. However, outbreaks can be unpredictable. Ever since Japanese beetles were first discovered in North America in 1916 in a nursery near Philadelphia in Riverton, New Jersey, they have been gradually moving westward. Trailing behind the beetles are a whole host of natural enemies. Where the beetles have been living for a number of years, such as in Ohio, the natural enemies are able to act on this non-native pest just like natural enemies act on native pests. So, populations can rise and fall dramatically from year-to-year. I believe that’s what we’re seeing: a “natural” population rise that I predict will eventually fall. How can I be sure? Because, we’ve seen it before.